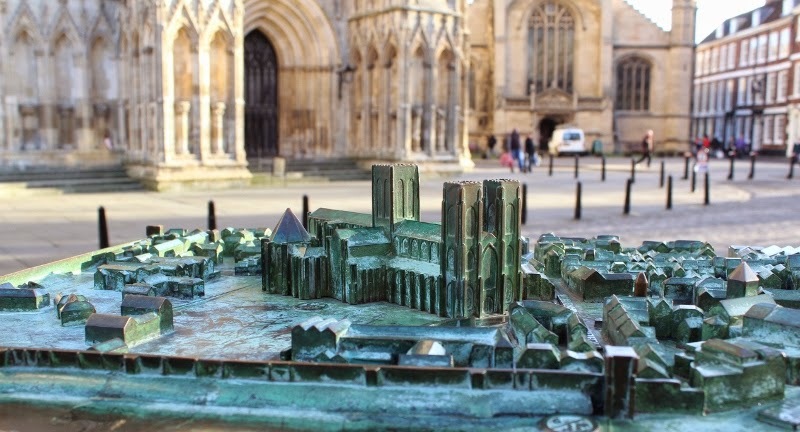 This bronze model of the city centre of York is sited outside the west end of York Minster. Designed by The Dog Rose Trust it has Braille labels and is set at a height that is wheelchair friendly. Above all it is a tactile model that can be and is enjoyed by any visitor to the city. This is my 1000th post on CDP. I will be taking a break for the summer but hope to be back in early autumn. Like the way you were able to capture the model AND the cathedral itself. I missed that when I was there - will have togo back one day! Will miss your posts but have a great summer, Deb! A perfect choice for your 1000th post. And congratulations! Have a good break. Many congratulations on 1000 posts Deb! You are a fine ambassador for York. Lovely to see you for lunch yesterday- enjoy the rest of the summer.